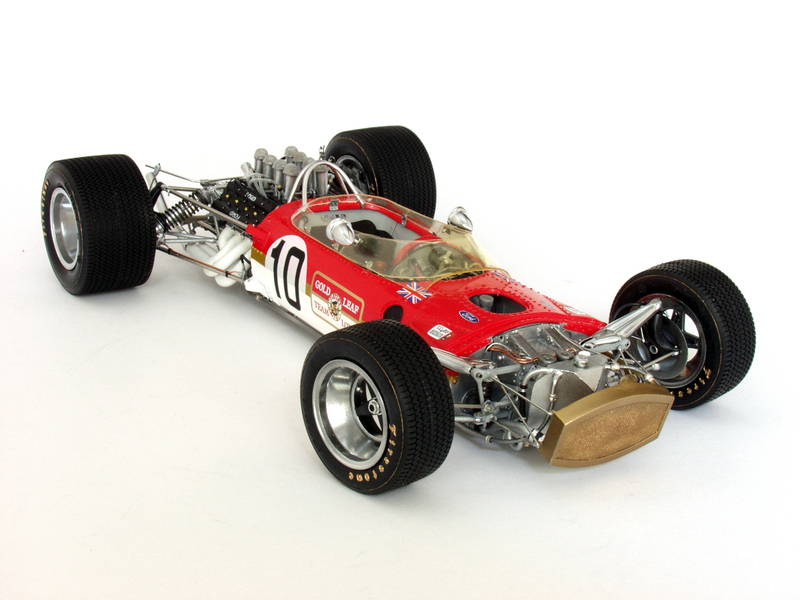 This model started in 2007 and completed in 2008, represents that driven by Graham Hill in the Spanish Grand Prix, at Jarama. Where Zandvoort ’67 had been the first race for the 49 (Hill R1, Clarke R2), Jarama ’68 was the last race for the 49 before the introduction of the 49B. Additionally, it was the first Grand Prix for Lotus with sponsorship covering the car in the new colours of red white and gold of Players cigarettes; this was the taste of things to come, for as in most things, team owner Colin Chapman was boldly innovative. 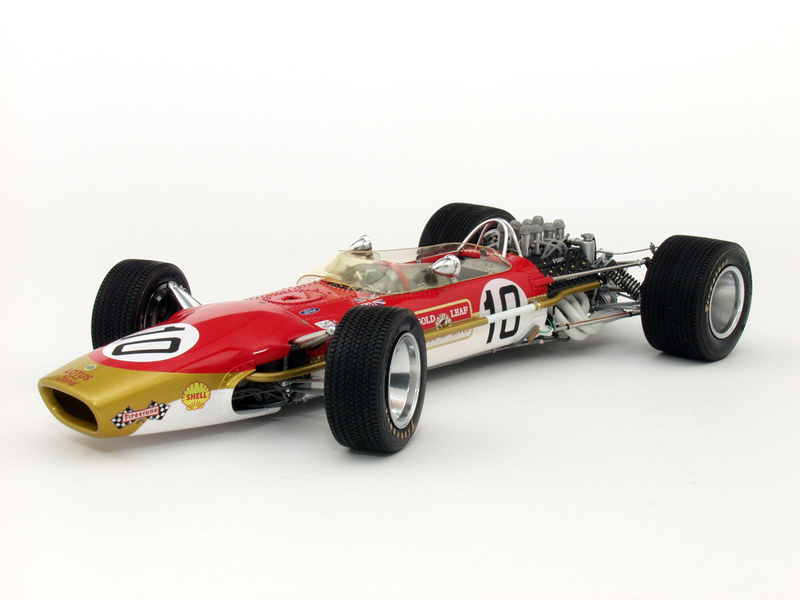 Sadly however, although Jim Clark had raced a Gold Leaf Team Lotus 49T during the 1968 Tasman series in New Zealand winning the Tasman Cup, he died in a Lotus 48 at a Formula Two event at Hockenheim (Germany) on April 7th 1968. The next Grand Prix being the Spanish, it fell to Graham Hill with his wife Bette to pick up team spirit and spearhead the works team’s single entry, for Colin Chapman was so upset by Clark’s death he could not attend, so low was team morale. Lotus had qualified one-two at the South African GP a few weeks earlier where Clark had won (with Hill second) in the final Lotus car resplendent in British Racing Green with yellow stripe running up the middle of the car. Hill qualified sixth in Spain and made his way up into the lead, only for a late challenge by Denny Hulme (McLaren M7A) to be thwarted when the New Zealander lost a gear leaving Hill to win as he pleased. This win was life-saving for team Lotus on a human level and spawned the continued confidence in each other, to enable Graham Hill to go on and win the 1968 Drivers’ World Championship. Whilst Hill drove the new 49B, Lotus 49’s ran after this event either in Rob Walker colours (Jo Siffert, further four GP’s) or driven by Jackie Oliver for the works team once more at Monaco ’68, but at that race, R1 was effectively written-off shortly after the start. [P.S. Utilising parts of R1, a new car 49 R1/9 was built-up, only to be badly damaged again during the winter Tasman series before being re-built as 49B R1/9 for the 1969 season. During the Spanish Grand Prix at Montjuich Park, Jochen Rindt suffered catastrophic rear wing failure, catapulting the car from one Armco barrier across the track into the wreck of Graham Hill’s sister car abandoned at the side of the circuit after similar rear wing failure a few laps earlier. Rindt was less lucky as his car continued on down the track upside down along the Armco before coming to rest, Jochen mercifully suffering only a broken nose and concusion. R1/9 was truely written-off on this occasion, the monocoque being so severely deformed]. when time permits, more photos to be added. During 2007/8 a twelve month project required an estimated 1000 hours work (vast reserves of kindness and tolerance from my family) and has involved subcontracting out certain specialist aspects of the build. 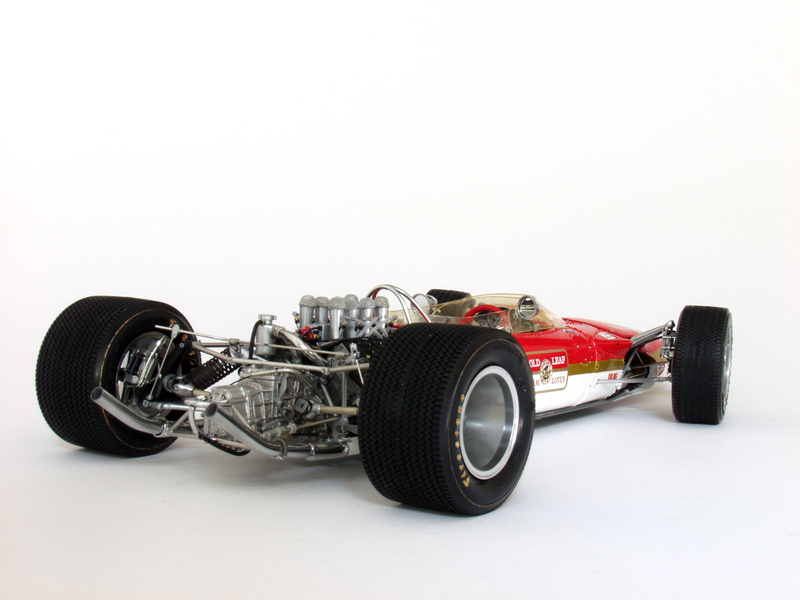 In order to achieve an acceptable level of accuracy, I studied Lotus 49 R3 in the National Motor Museum at Beaulieu, Hampshire for many hours and repeat visits. Thanks are due to the very kind staff there for allowing me to do this. In addition, many books for researching R1 at Jarama in 1968 were consulted, chief of which was Michael Oliver’s book, Lotus 49 published by Veloce, 1999. 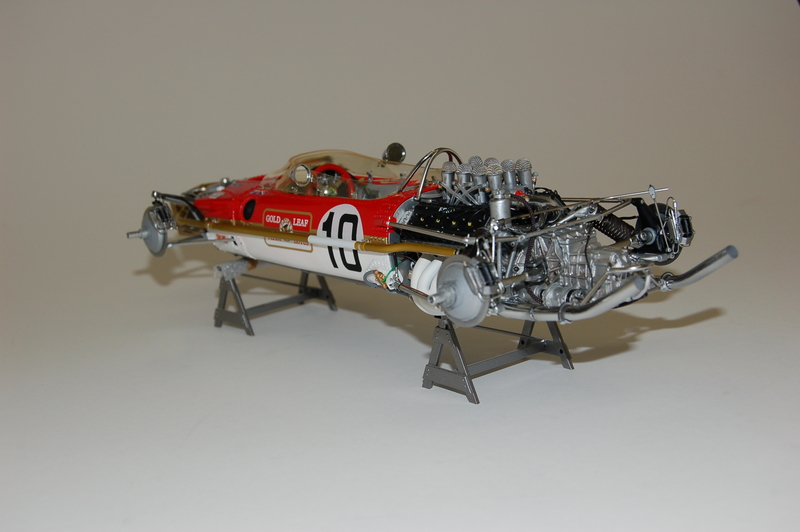 An old built version of the commercially available Tamiya 1/12 model, served as a base kit for the project. 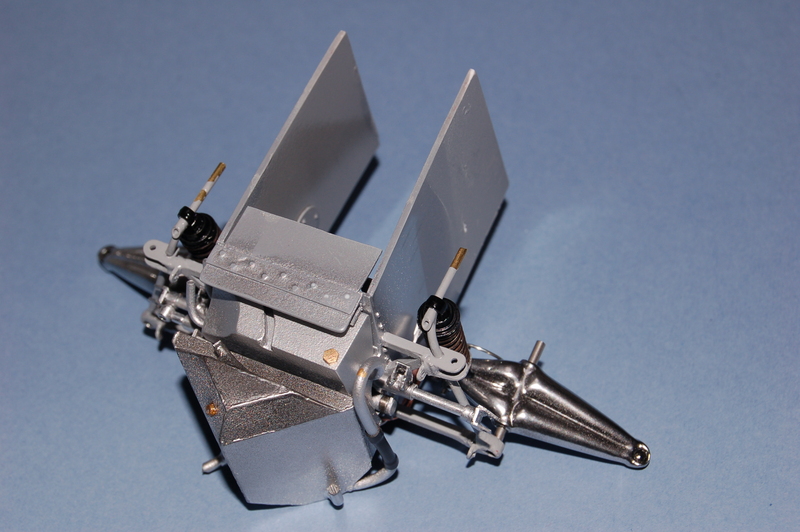 Essentially, this model is scratch-built including the re-profiled monocoque. The wheel rims were modified kit based items and the tyres were also from the kit. 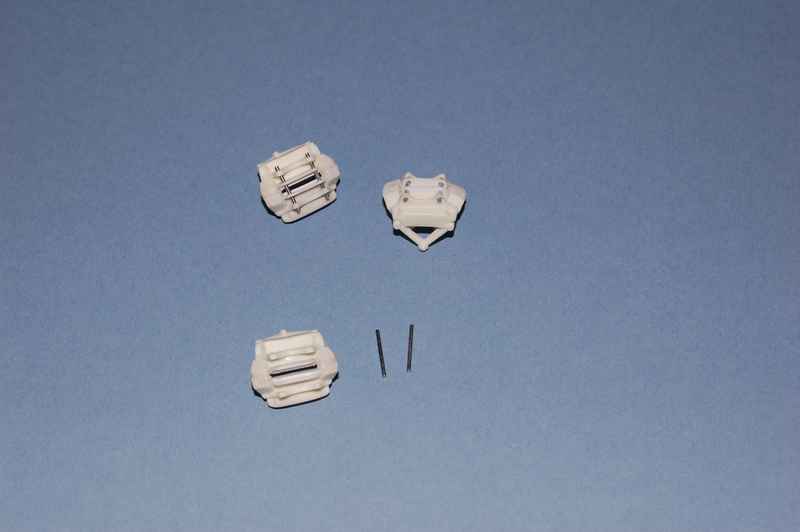 A mid- 1970’s Ford DFV engine was acquired for which I remade the cam covers and had these cast in resin. The later basic engine block and ancillaries have been greatly enhanced by very significant super-detailing such that there is nothing visually absent in terms of hardware or plumbing. The specific Lotus 49 bits and pieces from Tamiya’s kit were all discarded, even the carburettor trumpets were remade in resin (aluminium replacements would be ideal and a model engineer friend Jack C made some which will have to be retro fitted to replace the resin items – since Spring 2010, I could theoretically make my own, having acquired a lathe this year). A complete throttle assembly has been added and all oil, water and fuel plumbing have been accurately reproduced and can be followed through from origin to conclusion whether at front or rear of the car. Brass rod of varying diameter was used to replicate oil/water pipes. The new firewall is fully detailed with all original electrical and fluid lines in place to lie neatly around the DFV forward panel, which lies in contact with the firewall. The engine is attached to the monocoque via two pins below (via the Cosworth favoured DFV/monocoque bracket) and by two pins through the brace-plates above, these pins being removable so as to disarticulate the engine if necessary. I have paid attention to detail re period-appearance of fluid lines and unions. Tamiya’s oversimplified forward oil/water radiator, footbox, oil tank, catch tank, steering and suspension hardware, have all been replaced along with the scratch-built subframe, nothing here from the kit being of use except the oil filler and master- cylinder caps etc. The cockpit was entirely re-made, utilising only a modified steering wheel. Leather seat material was tried and seems to ‘work’ having a used-look about it. 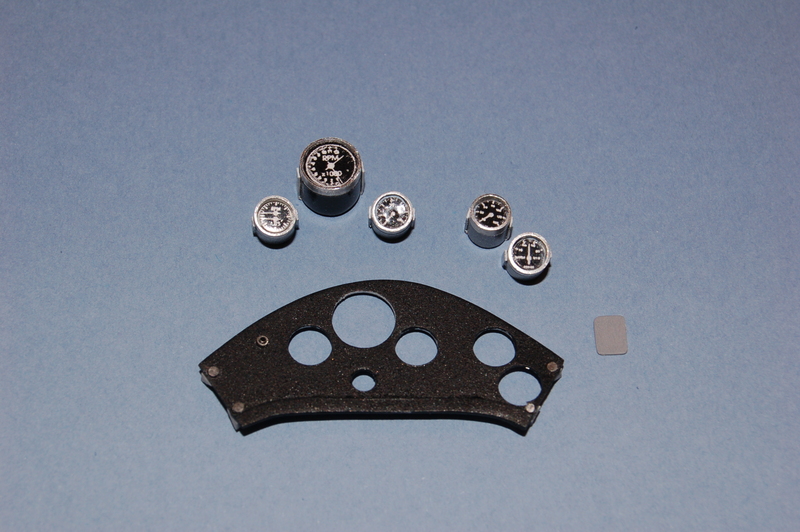 The gear lever mechanism was re-made with 25 new parts. A battery was wired along with the fully detailed scratch-built dashboard and instrumentation, the wiring and fluid plumbing being routed through to the relevant area whether within the engine or on the forward oil tank/water rail. Fuel-taps lie either side of the forward aspect of the seat. Brass rod was used to replicate a more correctly sized two part roll-over bar. The front and rear uprights were remade and cast in resin, as were the front rockers. 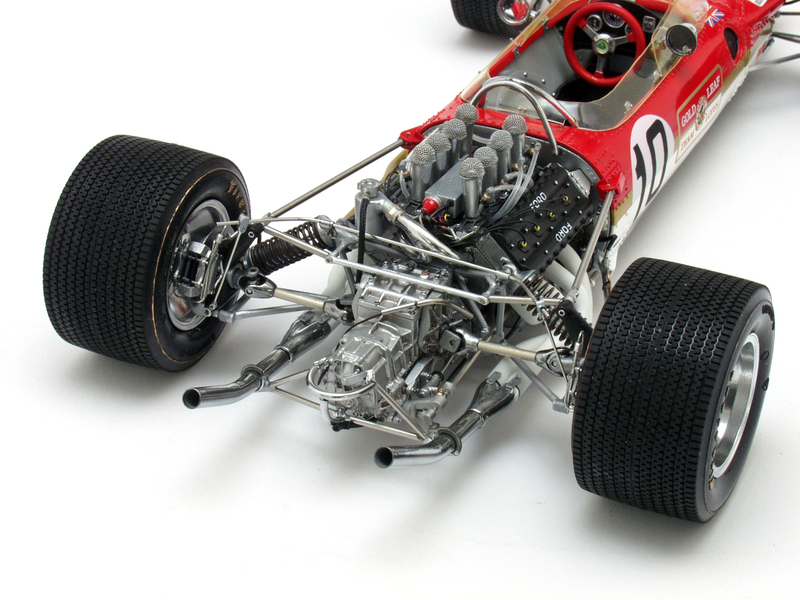 All suspension components were remade in aluminium/steel and brass and only modified forward limbs of the front lower wishbones were utilised from the kit. The rear lower wishbones were also significantly modified with the coil-spring-damper units being retained. 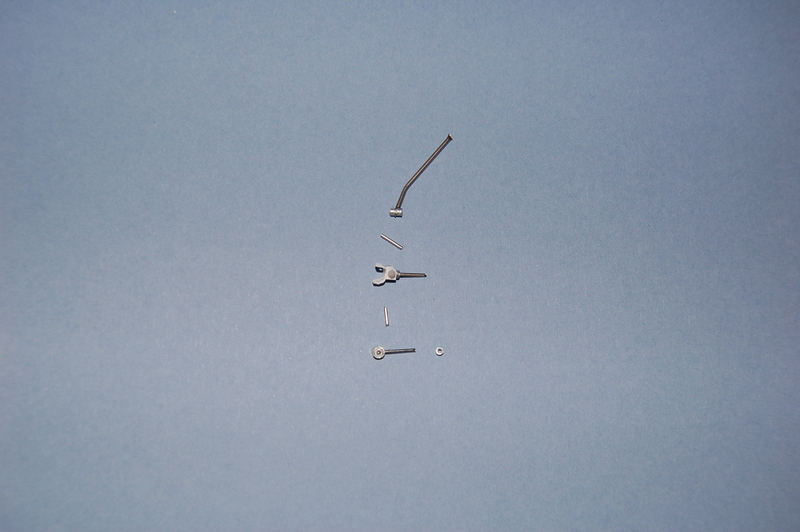 The suspension can be disarticulated from the model by removal of steel or brass pins. The brakes are fully detailed and plumbed from master cylinders, back. The only removable piece of bodywork, namely the nosecone was re-profiled in a subtle manner requiring excessive man-hours to achieve, intending that it should look ‘right’. Access panels over the monocoque top and sides were opened up for pedal access centrally and fuel tank access laterally in order to assist rubber bag tank insertion. Rubber sheet was fitted internally to replicate the bag tank material, having removed the tank access panels. 1) ZF gearbox. 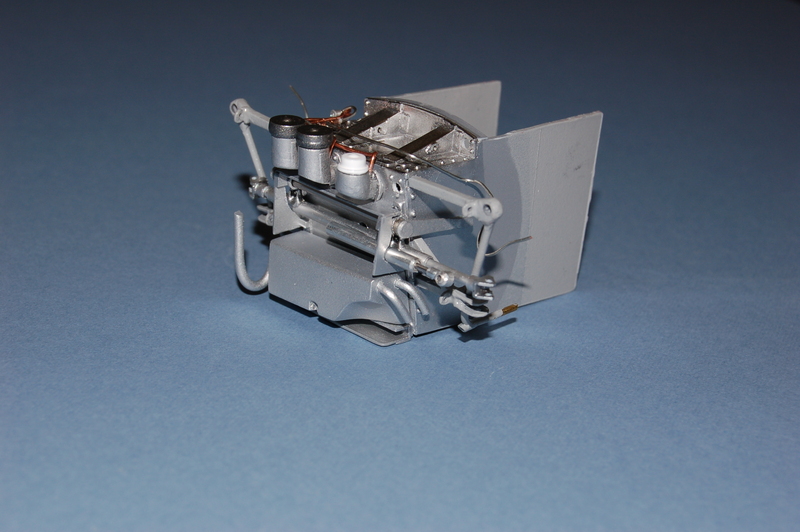 An accurate ZF gearbox does not exist in 1/12 scale, for the one supplied in Tamiya’s kit is significantly compromised in order to allow incorporation of an electric motor. So a ZF gearbox was examined and drawn, photographed and measured from the exhibit at Beaulieu, namely Lotus 49 R3. These details were sent to Brian F in 2003 who made a pattern and cast in resin the main case, side and top plates and various ancillaries (starter motor, gear selector, clutch slave cylinder and actuating lever). Side and top plates come in two forms, the original used at the Dutch Grand Prix in 1967 on the Lotus 49’s debut race and those used later that season, which were more robust and used on the 1968 Spanish Grand Prix winning car. 2) The windscreen was re-made according to a more accurate shorter cockpit aperture derived from measurement studies of R3. This first generation screen was then vac-formed with help from Brian F, further improvements being in the pipeline. 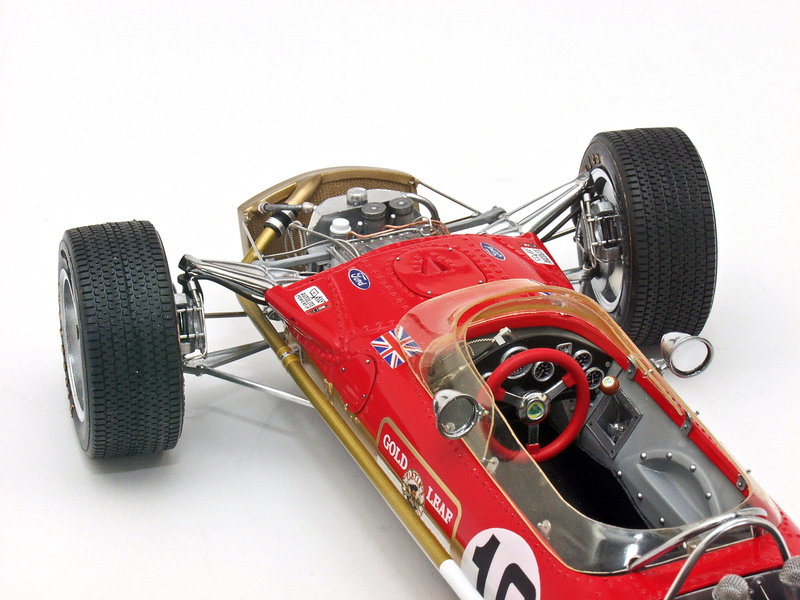 3) The original kit decals were laboriously re-assessed (MRO) and new designs were commissioned and skilfully reproduced by ‘WB decals’ for this specific model and other Lotus 49’s in Gold Leaf Team Lotus colours. It took one year to make all the parts, have them fettled during numerous dry-fitting exercises and have them ready in spray painted grey or white primer. Then one month before the model was due to appear in one of the rare shows I attend, I had to start the painting and assembly. One week before the show date, the gearbox arrived and within a week, the decals arrived. Fortunately, the rear suspension had been fabricated around a dummy gearbox of the correct final dimensions, so it was a question of preparing the final resin cast with metal modifications, spray painting etc before fitting it to the back of the completed DFV and then re-assembling the rear suspension around it. The decals were printed via an Oki printer and arriving so late were a rush to get them placed correctly in the few hours available around work, before travelling up to the Midlands. Most were in place before setting out for Telford (Modelsport 2008), however the race numbers and the tyre wall painting had to wait until I arrived at the hotel, another late night to go along with the month of nights working ’til midnight or 1am and getting up again at 5am – Lotus all-nighters almost! Final touches were placed in the morning, just before the car was presented on wheel supporting stands suspending the model an inch or so above a black acrylic base with central rectangular inset mirror enabling viewing of the undersurface of the car.